The Jumbos dropped both of their games at the New England Big 4 Challenge this past weekend, hosted by the Babson Beavers in Wellesley, Mass. 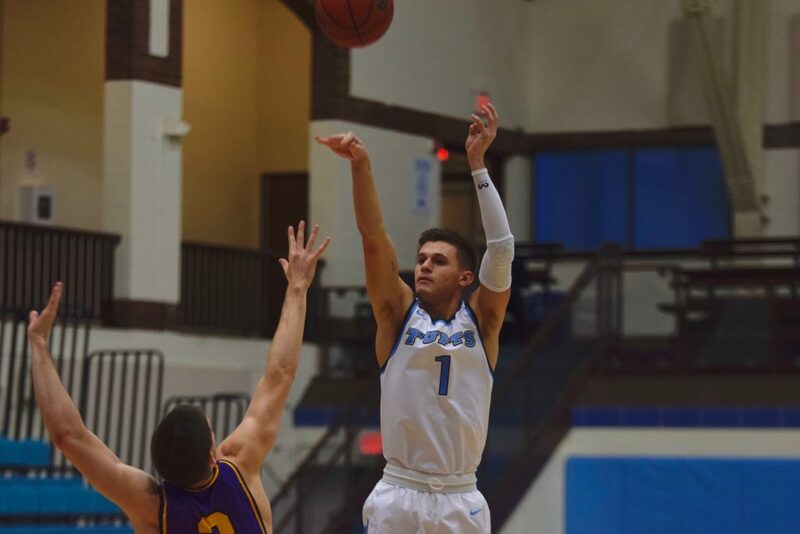 Tufts’ two losses dropped its record to 2–4, but it was able to make up some ground on Wednesday hosting Emerson, clinching the 87–70 win. The annual Big 4 Challenge, hosted by Babson, also featured Tufts, Brandeis and Salem State. These local teams are no stranger to one another — Tufts played Babson for the seventh time in the tournament’s history and their 42nd head-to-head matchup overall. Coach Bob Sheldon commented on the weekend’s results. Tufts’ win against Emerson Wednesday featured scoring across its starters and its bench, especially its younger players. First-year guard Tyler Aronson led the Jumbos with 13 points, while three others — including first-year guard Carson Cohen — put up more than 10 points in the game. Emerson’s biggest lead of the game came when it made two early buckets, but Tufts soon took over and never looked back. While Tufts edged a narrow first half, 31–26, the team’s offense finally took over in the second half, putting up 56 points to seal the victory. What decided the game in Tufts’ favor was its ability to convert its free throws (31-of-35) compared to Emerson (17-of-25). Tufts fell to Salem State, 84–90, on Sunday. Regardless, sophomore guard Brennan Morris put up 29 points and 10 rebounds in the effort — his first double-double of his collegiate career. The first half of the game was very tightly contested, with neither team pulling away for even a minute. The lead changed multiple times over the first half, with the Jumbos leading 31–27 with just under four minutes to play. However, the Vikings caught fire just before the break, entering halftime with a 41–35 lead. Salem State successfully swung their momentum forward, coming out with a purpose to start the second half, while junior guard and co-captain Eric Savage and his teammates struggled to score. “I myself have been struggling from the 3-point line for sure,” Savage said. “I know some other guys might not be shooting it great or as well as they can. We have faith in our offensive talent. Those … shooting stats are [going to] start to even out over the next few games. I have full faith in our offense. Something that will help is getting stops on defense so we can run in transition and start to get easier looks, high-percentage shots. There’s no immediate panic button; I have full faith in our offensive ability. Despite their struggles, the Jumbos kept battling, with Morris contributing shot after shot, including seven 3-pointers. Eventually, the Jumbos pulled within two, 86–84, with 28 seconds left in regulation. However, Tufts was unable to post any more point until the buzzer sounded for the 90–84 loss. Despite Tufts’ 94–73 blowout loss to Babson Saturday, there were nevertheless some bright spots in the team’s performance. Aronson had an impressive performance as he scored 17 points and four rebounds, while Savage posted a double-double with 13 points and 10 rebounds. Tufts was on its heels all game, with Babson jumping out to an early 10–4 lead and eventually expanding its cushion to as much as 19. The Jumbos battled back, reducing the gap to as little as eight through Morris’ 3-point shot with four minutes on the clock. Thanks to a Beavers run, the Jumbos fell back to a 50–29 deficit by halftime. Already down by 21, the second half remained relatively uneventful for the Jumbos, who were simply struggling to stay in the game. Both teams scored 44 points in the second half, but a tie was not what the Jumbos needed to erase the early-game deficit. Savage expressed confidence that the team will learn from both its losses and wins. Sheldon applauded the first-years’ contributions over the weekend and remains positive about their performance for the rest of the season. “They’re [going to] play a lot all year. We’re hopefully building on everything. We put the ‘fun’ in ‘fundamentals.’ Everybody’s playing, and we’ve got to get the rotations down, but [the younger players] are getting valuable experience. We’ve had blowouts, we’ve had close games, we’ve had close wins. So it’s been a run of the gauntlet, and I think it’s [going to] be like that all year with a young team. Hopefully we’ll grow up sooner rather than later and be able to finish games out,” Sheldon said. Tufts will finish out the fall semester by playing matches against UMass Dartmouth and Framingham State on Monday and Wednesday, respectively, and will not have much time off during the break. Nonetheless, the team is looking forward.